It is that time of year when I start thinking about spring. It is still cold outside, and we can still end up with a few more snow storms before spring arrives. But there are signs of spring, like green buds on bare branches and small fern fronds peeking up from the ground. And the birds, with their nest building built into their DNA, is another sign of spring. And after the winter months, we look for signs of hope and renewal. 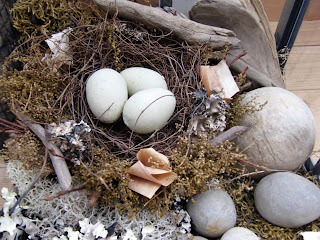 I have this nest on my front porch-- I often find it disturbed by creatures like squirrels and birds who seem to help themselves to the twigs and straw and odds and ends to make new nests. 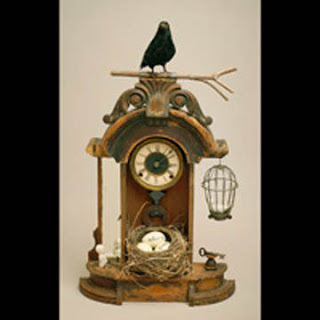 Chris Giffin is a terrific artist who collects and assembles recycled and found objects into beautiful assemblages. You can find her work at these two gallery websites here and here. In this work a nest of weathered bones cradles a single luminous egg, a symbol of hope and possibility amidst death and destruction." You can find more of her beautiful works at her website here. Lelarnie O'Sullivan is from New South Wales, Australia. 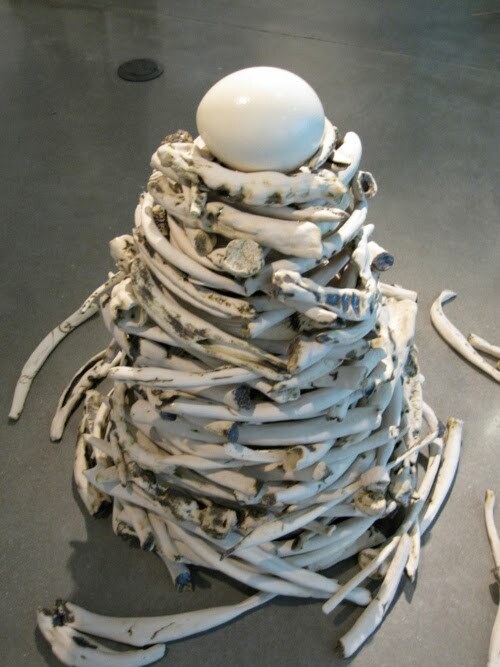 You can find out more about this artist and her work at the Visual Arts Network here. 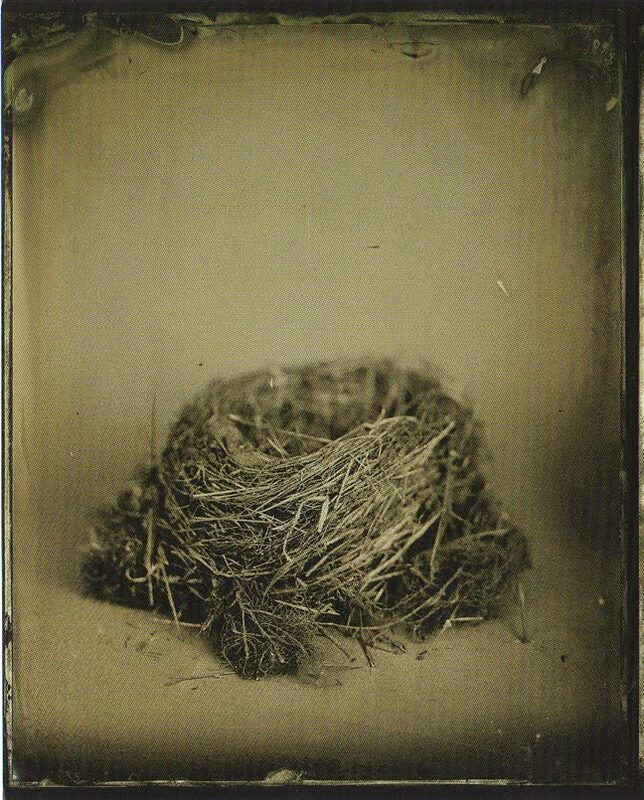 Susan Seubert, fine art photographer. Find more of her beautiful photography at her website here and her work at this gallery in Portland, OR here. Your post -as usual- brought me to a most calm and reflective state; the overture (your collage) and the finale (Susan Seubert's worlk) made it a most memorable composition, something that truly touched me. Thank you!!! As always, you create a lovely and calming atmosphere, a peaceful place to visit. I particularly like the nest on your front porch. 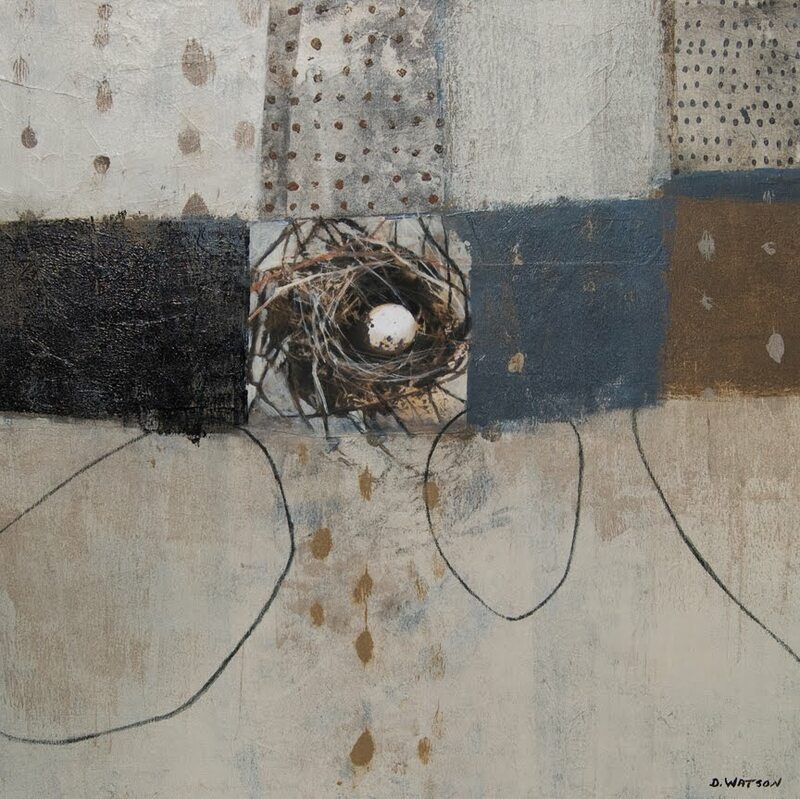 I too relate nests & eggs with renewal & it so happens that I am working on a small nest/egg painting at the moment. So this post was perfect for me. Thank you. 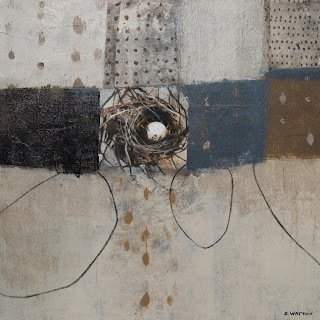 The nests are such comforting images to me, and your collage has the same tone. Beautiful work as always. Love your new collage. Calming as your post. And yes to Spring! Those tree buds are definitely whispering Spring around here. I once had a deer antler the small creatures would come and gnaw in the night, squirrels and such. 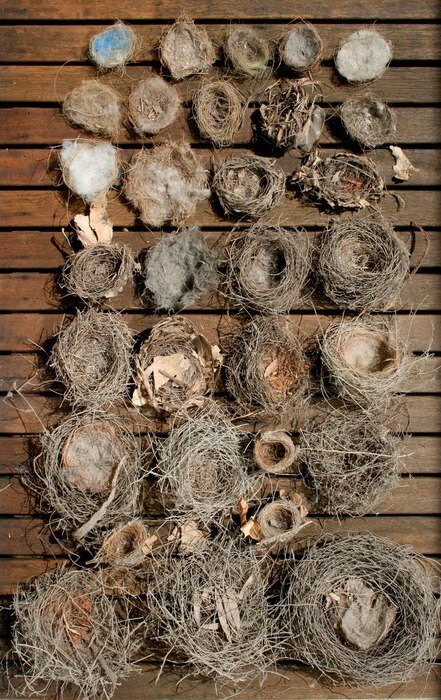 Your comments about your nests on the front porch reminded me of this. Spring, and your post is beautifully satisfying. Your Collage is wonderful. I love the colors. And your thoughts of spring are so real and natural. Here in the mountains of Bavaria is still a lot of snow, but the meadows in the valleys have been "cautious" green. but the best thing is, that it is a little earlier in the morning bright and the birds are singing. Simply fantastic. Spring - here we go. A lulling, comforting post with beautiful images and quotes. This time of the year on my side of the world, we begin finding deserted nests and the birds start preparing themselves for the colder seasons. Though it's still pretty hot! ton tableau en première position est merveilleux.. et les nids .. les oiseaux sont aussi des artistes! Thanks for some beautiful shots and lots of links to check out. 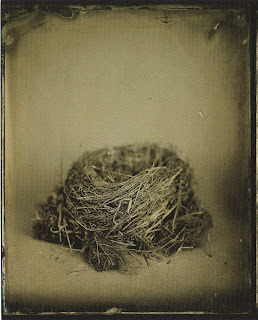 I would love to find an abandoned nest, but in all my wanderings and hanging out in the woods, I have never found one. Beautiful! That feeling of renewal, that wonderful excitement as the world around us re-awakens, that delightful quickening...you've captured it all so well. Lovely work, yours & Lelarnie O'sullivan particularly. The greenhouse is such a perfect place to keep MY things that have been 'cleared away' from in the house - to be fair I do have too many 'collections'! I hang some from my ceiling beams in the studio but I could put some pieces in amongst the seeds in the g/h. THANK you! Donna, your post creates an ambiance of reflective serenity. Thank you for the introduction to my country woman, Lelarnie O’Sullivan. A very beautiful post! Years ago the bird's nest was my favorite thing to draw....I have been thinking about returning to it again. It's always fun to see for ourselves, how we do something, and then years later how to see what we do again. Thank you so much for a tender post! You inspire me. Take refuge in elephants, in words, in silence. Yes indeed. Although morning is starting to have just a bit of birdsong to fill the silence. a huge old tree here dropped a good nest on my driveway in, such a nice gift. the bird song in the morning now is multi-textured, like a weaving of awake. this morning I read from Jane Hirshfield's Women In Praise of the Sacred: thirtenth century Japanese Zen Master Dogen said, It is out of the bone-freezing winter that the plum blossom bloom--spring rubs hard at the nostrils." Without the requisite number of hours of winter-chill, fruit trees will not bear. How beautiful are the images you have chosen to show us. Mostly I love your work and your gentle heart. You've made my day... how beautiful a beginning. Your painting is so quiet and reflective. Thanks for sharing links to other creative minds. 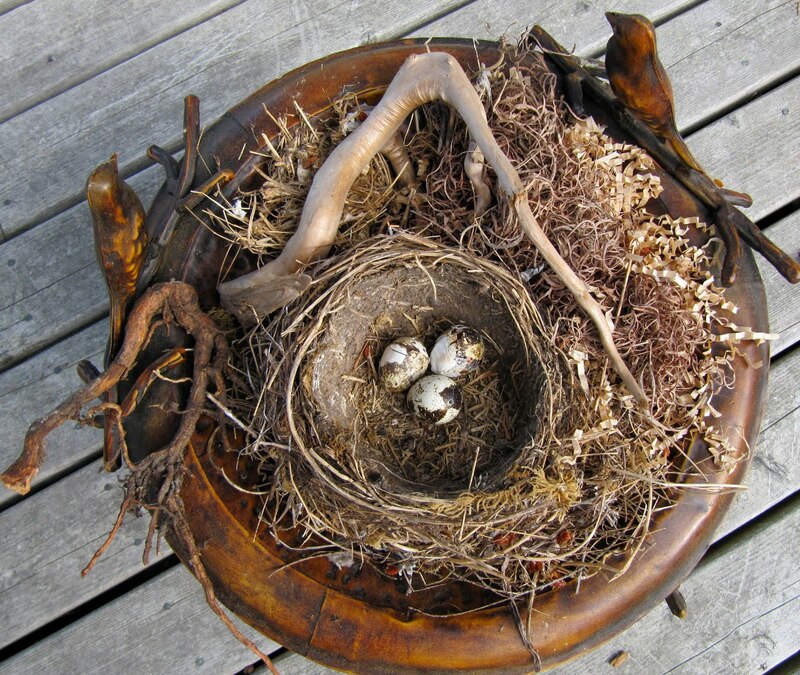 Birds nests, buds and fern fronds who could fail to be stirred by such thoughts? Here in the UK we are also expecting a few more snow storms but with a noticeable increase in birdsong and the lengthening of the days I feel that hope is everywhere. 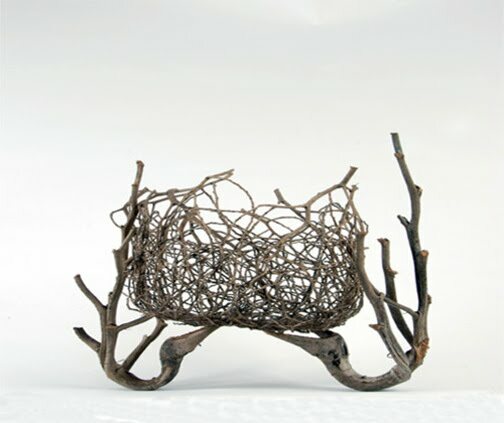 Donna, I am loving all of these nests...and the untold possibilities they hold. Beautiful! 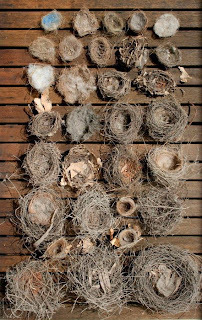 A great collection of nests, thanks. You remind me that its almost time to put out some colorful yarns to see if I can see them in nests later in spring! 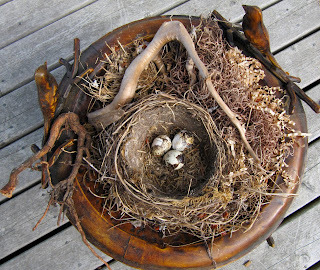 Nests and fern fronds are such magical reminders of the change of seasons. I just adore seeing my little fiddleheads pop out of the ground! Several artists that i adore and a stunning piece by you...I see you've emerged from your studio with a brilliant new piece. Your front porch nest is so inviting.. I can see why the critters sneak in and sneak bits and pieces. What are the eggs made of in that nest? They look so real! just beautifull again, all these little nests, I love them to and collect. A friend showed me a nest entirely made of wire, probably from a crow. A wonderful theme for this time of the year. Spring is definitely around the corner. Thanks for sharing these images as a prelude. Your blog posts are a real work of art. Quite the most beautifully put together blog that I have ever read. Oh Donna, these nests of beauty are almost as beautiful as your words. I am thinking of spring as well. Soon the green will return. He is inspiring and it is great pleasure to read it. I am excited about your collage and recognize the signs of renewal. I love your Cycle of Life collage Donna. I find myself drawn to the numbers that seem to be spiralling out from the nest, 0 0 1. I LOVE, LOVE, LOVE THAT PIECE. And I always anticipate the beauty that's here in your post to be explored. Today's visit is wonderfully serendipitous as I had just posted a bluebird's nest from last spring...I'm traveling in the north and we had a blizzard three days ago but at home 600 miles south the quince, daffodils, purple plum and magnolia are in full bloom.